When someone asks me ?what is draft angle in a box?? 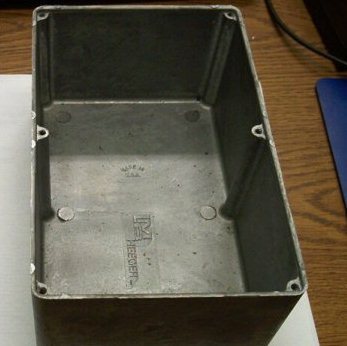 or ?why do I need a draft angle on my aluminum die casting box part?? The technical answer is, all aluminum die castings require a draft angle on the walls of die cast box parts perpendicular to the parting plane or parallel to the slide interfaces. Since I have selling die cast parts for over 20 years, I find simple answers and provide simple calculations for my customers. What does that mean to the typical engineer (any engineer other than tooling or mechanical) or professional buyer? I try to give examples that most people can relate to, because most people do not have a need to concern themselves with how things are made, only what is made, and will it be what they need. I ask, ?Have you ever noticed on a cupcake the bottom diameter is smaller that the top diameter?? or ?Have you noticed that a cake pan has sides that slope in toward the middle of the pan?? That would be an extreme example of a draft angle. Aluminum die castings would stick inside the die casting tool, molds, or die casting die if there was not enough draft angle in the tool and part. The typical draft angle for an aluminum die casting part is two degrees per side. The calculation for that is simple if a person is familiar with die casting production part design, but is not familiar to most people. The overall height of the box is 2.10? tall. The interior of the box at the top of the opening is 3.80? x 3.80?. The top inside dimension of the box will be 3.80? and the bottom inside will be 3.664? The top outside dimension of the box will be 4.00? and the bottom outside will be 3.864? The top inside box dimension needs to be 4.136? The outside top box dimension will be 4.336?. These are examples how a simple box needs to be considered with end result in mind. More complex shapes require quite a bit more thought and consideration. The biggest issue the typical die casting company has with the die casting part draft angle, it that some quality inspectors do not understand draft angles. Sometimes an inexperienced inspector will measure a part and not know that there is a draft angle present. When this happens a part can appear to be "out of tolerance". Inspection houses using CMM's should know better, but they sometimes confuse a die casting part with a cnc machined part. This rarely happens, but it has happened. Call me if you have a design in mind and I will give feedback on the draft details.